Ruthin Gaol is a Pentonville style prison open to the public as a heritage attraction. Visitors can learn about life in the Victorian prison system and see how the prisoners lived their daily lives: what they ate, how they worked, and the punishments they suffered. We created a touchscreen interactive that includes video, animation and a children’s game. 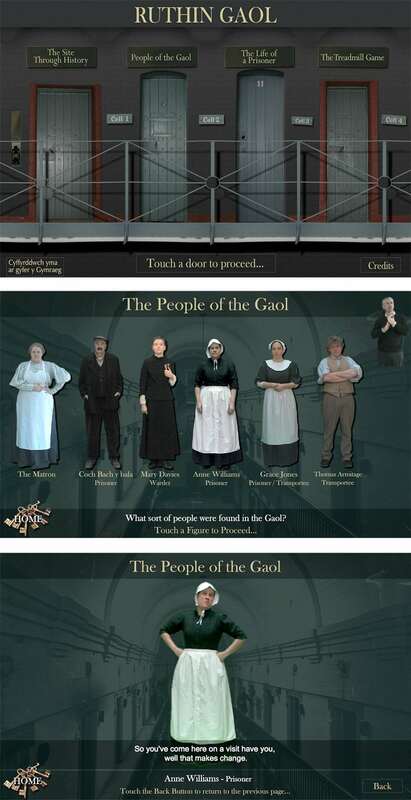 The gaol characters – which come to life when you touch them – were filmed by Media Vision, at the gaol, using a “green screen” system to overlay the actors on a graphical background. The bilingual touchscreen also features a deaf signer on all the main screens – again filmed against a green screen.